In a world of same-old jewellery - hippie beads and too-cool crucifixes - it is refreshing to find a label that focuses on the unique and individual in design and construction. Enter TMOD, a label started in 2007 by former COFA classmates Georgie Swift and Milenka Osen. With an eye for the weird and wonderful, TMOD captures that sense of beautiful uneasiness in our world. Bracelets that snake up wrists, milky stones that spin around pendants and pieces inspired by braille are just a few of the designs that Georgie and Milenka have exhibited through TMOD. Everything successfully fuses the visual with the physical - it is just as important to touch and feel the pieces as it is to wear them. 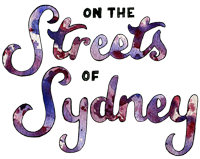 We caught up with designers Georgie and Milenka who showed us how they dress for a day On the Streets of Sydney. Visit TMOD to view the collection, and The Grand Social to buy online. Nice. I believe you mean Pierre Cardin not “Piete Cardin”. Hey, I love those Handsom tops. Especially the blue one on Georgie. Where can you buy them from?